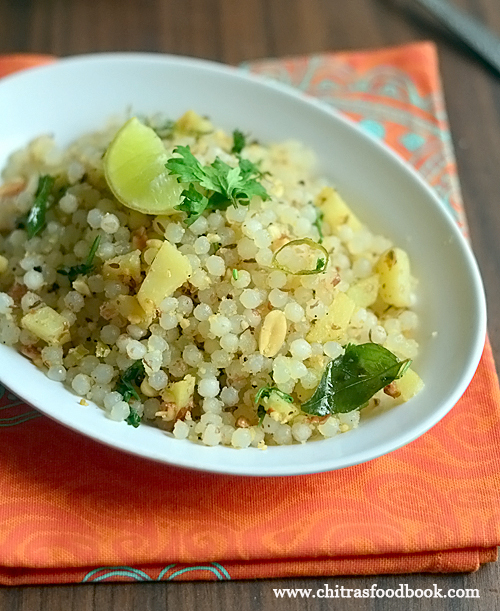 Making a perfect sabudana khichdi at home must be a challenging task for many ladies. Me too not an exception. Soaking and cooking sabudana (Sago in English, Javvarisi in Tamil, Sabakki in Kannada) soft and non-sticky is a bit tricky. 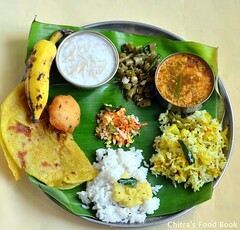 As Sendhil is a big fan of sabudana recipes, I try to make it once in 10 days. After so many trail and error, I started to soak sabudana perfectly without becoming mushy by adding the right amount of water. Earlier I used to cook it for more than 20 minutes to make it completely transparent and soft. But it becomes lumpy and sticky. When it becomes sticky, we cannot trouble shoot it easily. 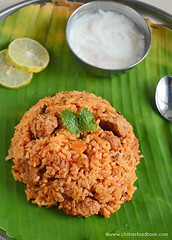 Sabudana turns soft, transparent and cooks quickly if its soaked properly. 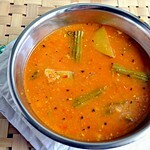 Cooking for longer time is also one of the reasons for sticky sabudana. So based on my observations, I have shared few tips and tricks for soaking, testing and cooking sabudana perfectly. 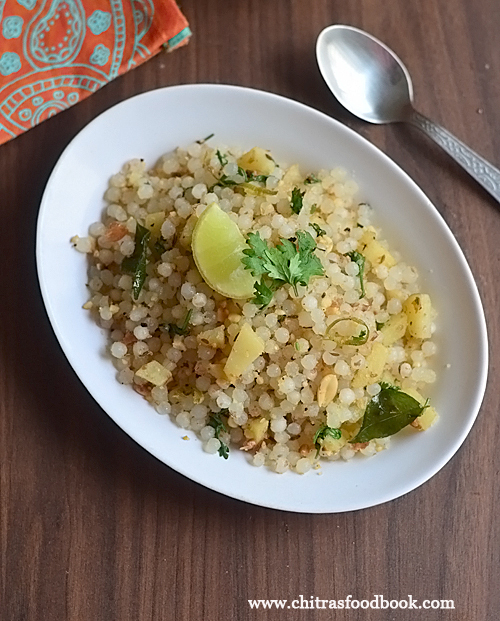 If you follow the steps carefully, anyone can make perfect, non-sticky sabudana khichdi at home. Ok, over to the recipe with stepwise pictures. 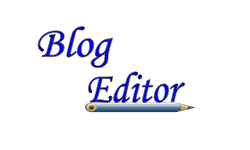 As I was busy in frequent travel to my native place for some personal works, I was not able to make any new post in my blog in the past week. Sorry, hope I can concentrate from this week. 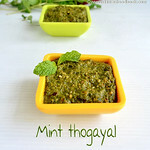 I will try to start the Diwali recipes from my next post. 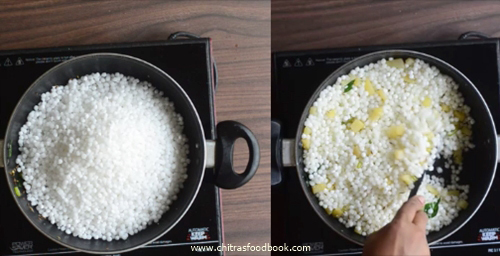 How to make non-sticky sabudana khichdi recipe at home with stepwise pictures. Wash the sabudana twice. Drain the water completely. Add water and soak for minimum 6 hours. Press to check it mushy. Drain the water completely. Heat ghee in a kadai. Temper cumin seeds, curry leaves. Add chopped potato, salt and saute till it becomes soft. Add chopped green chilli, ginger and saute well. Then add soaked sabudana, mix gently in low flame. Cover the kadai with a lid and cook for 2 minutes. Repeat until sabudana becomes transparent and soft. Do not stir more and keep cooking for longer time. Lastly add the crushed peanuts, lemon juice and coriander leaves. Mix well. Switch off the flame. Serve hot ! 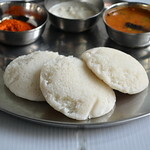 Wash the white, big sabudana/ sago twice or thrice to remove the whitish starch. Drain the water completely without a single drop of it. Add 1.75 to 2 cups of water( I used 2 cups) and make sure the water level is just 1/2 inch above sabudana. No need to cover the bowl. Soak the sabudana for minimum 6 hours to overnight. (Sabudana absorbs all the water within 2 hours and starts to double in size). After 6 hours, sabudana becomes big in size and almost double in quantity. It looks separate and fluffy without any water. To check if its soaked well, take one sabudana and press it. If it becomes mushy, sabudana is soaked well. If you feel slightly hard to press, add 1/4 cup to 1/2 cup more water and soak for some more time by covering the bowl with a lid. Dry roast the peanuts and crush it coarsely in a mixie. Set aside. Wash and peel the skin of potato. Chop into small cubes. Finely chop green chillies, ginger, coriander leaves and keep it aside. Heat ghee in a good non-stick pan. Splutter cumin seeds, green chilli, ginger and curry leaves. Add potato pieces and required salt. Saute well till potato becomes soft and 3/4th cooked. Add soaked sabudana, sugar and saute well till it starts to become transparent. Lower the flame completely. Cover the kadai with a lid and cook for 2 minutes without adding water. 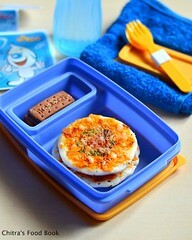 Open the lid and toss it gently. Again cover cook for 2 minutes and toss it. Repeat the same till sabudana becomes soft and transparent without much white part. It takes around 10 to 12 minutes to cook perfect. 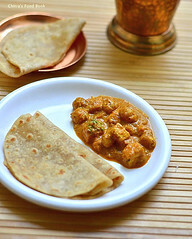 ( TIP : When you feel sabudana starts to become lumpy and sticking at the bottom, it indicates sabudana is over cooked. So switch off the flame immediately). Lastly add the crushed peanuts, chopped coriander leaves and lemon juice. Mix well and switch off the flame. 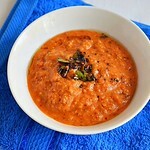 For variations, you can add crushed peanuts in the soaked sabudana before cooking. It also helps to make non-sticky khichdi. You can also add ginger chilli paste instead of adding as pieces. If you do not want to use potato, you can skip it too. 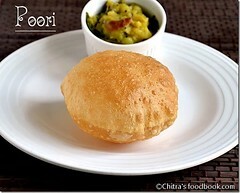 If you are not making as vrat/ fasting recipe, you can add onions too. 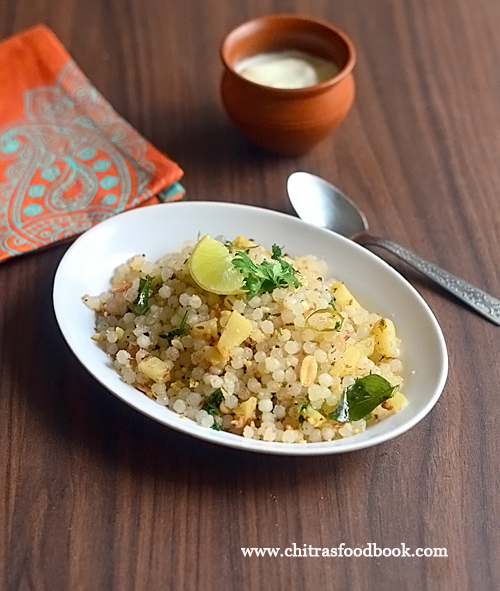 Try this easy, yummy, non-sticky sabudana khichdi for fasting days food. You will feel full and energetic !